Artists Gresham Tapiwa Nyaude, Wycliffe Mundopa, and Helen Teede participate in the Africa First Residency by Serge Tiroche in Collaboration with START Incubator Project, Israel. Wycliffe Mundopa, Helen Teede, and Gresham Tapiwa Nyuade in the South Tel Aviv Artist Studio. In 2017, START initiated Africa First, a by invitation residency program in Israel focused on Contemporary African artists. Artists are selected by Serge Tiroche from all over sub-Saharan Africa based on his research and contacts in the commercial and institutional art world. 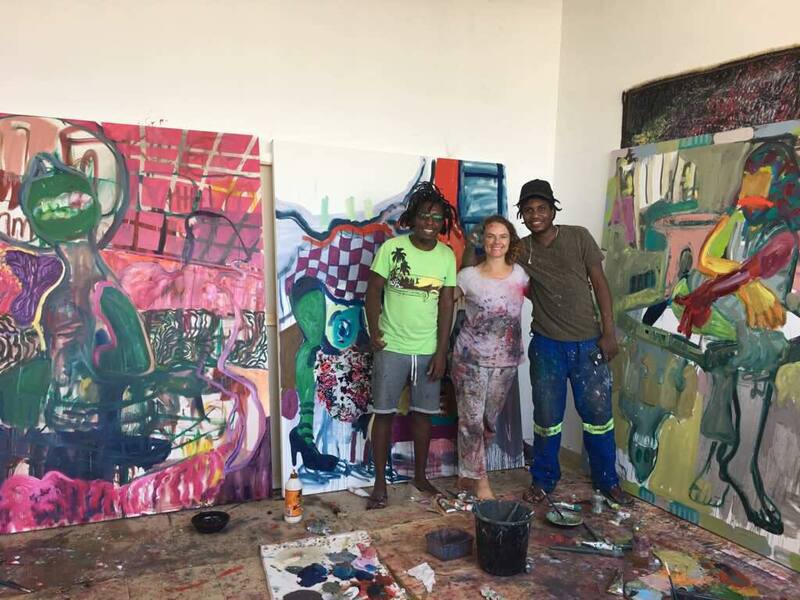 In Tel Aviv during July and August 2018, Africa First and START were delighted to host Gresham Tapiwa Nyaude, Wycliffe Mundopa, and Helen Teede, three up and coming painters from Harare, Zimbabwe. Gresham Tapiwa Nyaude was raised in Mbare, one of Zimbabwe’s most vibrant and notorious ghetto surrounded by violence and prostitution. Nyaude works against the sweeping identity that has been defined by the voice of the state. He takes the energy of the ghetto and inserts it into his artworks. His paintings are poetic and satirical. Nyaude’s starts his paintings with many layers of analogous colors forming bubble shapes, implicating movement. His tight color palette creates a camouflage look concealing figures and objects painted. The figures have mostly open mouths as if they are yelling and are sitting on chess rooks, a recurring motif. This piece in chess, comparable to a tower, can only move in straight lines in the four cardinal directions and is considered a powerful piece. The rook represents our physical power to act in concert with the worlds material structures. This is similar to traffic cones, a continuous theme in Nyaude paintings, which are used to create separation or merging of lanes or used to notify hazard construction ahead. Nyaude then frames most of his works, with paint, which creates an enclosing border. Gresham Tapiwa Nyaude, Bearing Gifts, 2018. During the Tel Aviv residency, Nyaude incorporated his surroundings by collaging found Israeli newspapers and writing common catchphrases. In the painting Bearing Gifts, 2018 Nyaude writes the Arabic term “ya-lah”- meaning let’s go. Ya-lah, is a common expression denoting "come on", "let's get going", or mostly meaning "hurry up". The widely used term Ya-lah defines the quick pace of Tel Aviv. 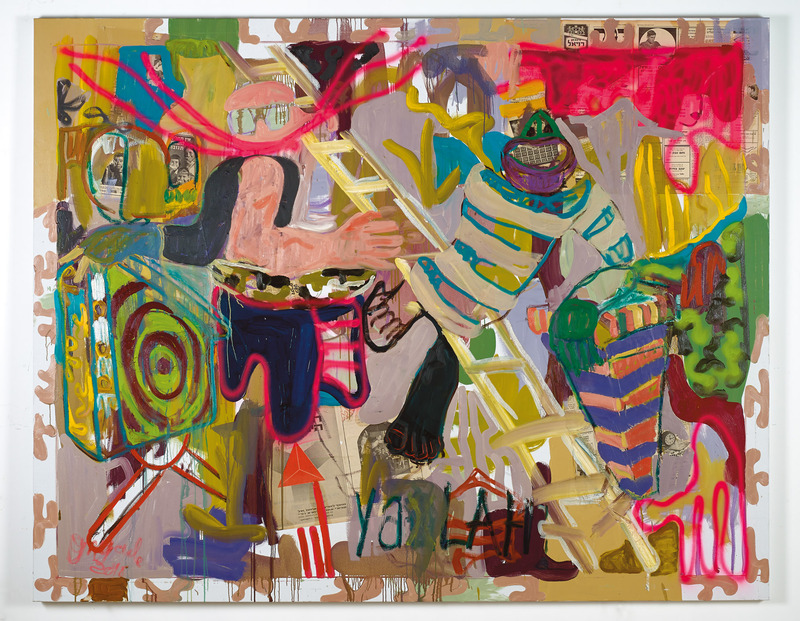 Nyaude’s works are lively with the sensation of the loud streets that can be found in Mbare and Tel Aviv. Wycliffe Mundopa’s work focuses on women and children of the underprivileged neighborhoods in Harare, Zimbabwe. His work also becomes an opportunity to see how painfully and vibrantly women’s lives reflect the conflicts of tradition and change of life in contemporary life in Zimbabwe, from the clash of moral codes to the economic strain, which makes children into adults too soon. Wycliffe Mundopa, He who casts the first stone, Part 4, 2018. Mundopa is known for painting figures in large groups, with a focus on the female form. He focuses on legs and torsos, some figures even having multiple legs. The clusters of women are lounging dressed in wild clothing often holding umbrellas, surrounded by bananas and dogs. In Zimbabwe, culture dogs represent protection and hunting. Mundopa often paints dogs in his works sometimes even taking over the faces of figures. 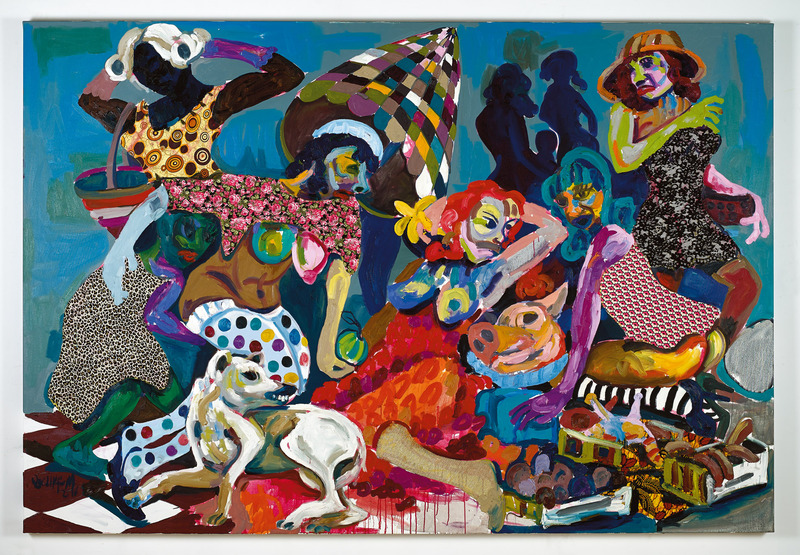 During the residency, Mundopa created paintings incorporating collaged fabrics which he found in Tel Aviv markets such as floral, polka dots, stripes, leopard and sequins. Helen Teede’s research and art practice are influenced by the relationship between power and writing and the historical trajectory therein. Her work is an exploration of the ways in which the earth's surface can be "read", and how we determine our position as a species that marks the world in impactful ways. During the residency, Teede created paintings inspired by photos of her grandfather’s home which was in process of being demolished. 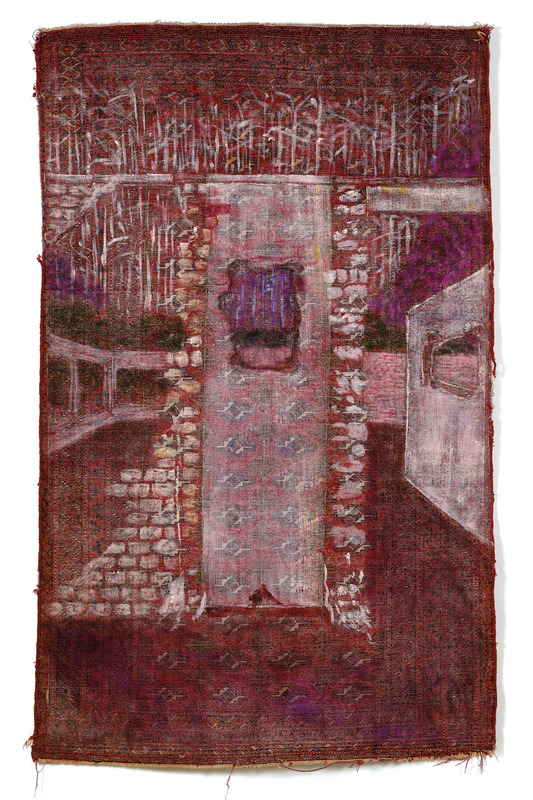 She explored painting on new surfaces such as carpets - which she bought at the local Yafo flea market. Teede takes the domestic object and brushes multiple layers of paint creating history with the material. Previous artists in the program have included sculptor Terrence Musekiwa from Zimbabwe, photographer Mario Macilau from Mozambique, multi-media artist from Isabelle Grobler from South Africa and most recently Sadikou Oukpedjou from Togo and Ivory Coast who exhibited artworks made in Tel Aviv at the Gallery for African Studies in Tel-Aviv.